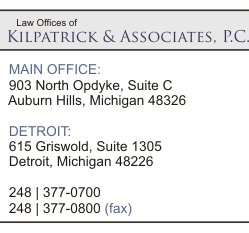 At Kilpatrick & Associates we believe that efficient legal representation, creative problem solving, and prompt and effective communication are essential. We offer a level of service that extends beyond the routine client-counsel relationship to build a partnership that's driven by results and is based on a deep investment in each client’s success. We strive to become a trusted resource for our clients, understanding the challenges they face and working diligently to tackle issues ranging from the highly complex to the kind of day to day matters that our clients face on a regular basis.